The season finale of BBC America’s Orphan Black airs this Saturday, June 1, and it has already been renewed for a second season. I spoke to executive producers Ivan Schneeberg and David Fortier about the challenges of a serialized show, how all the clone scenes are shot, and taking their love of coffee to the extreme. FOG! : How did you come up with the idea for Orphan Black? David Fortier: Well, it was John Fawcett and Graeme Manson who came up with the idea. We optioned the script that Graeme wrote 4 years ago. I guess they had been working on the script for quite a long time– it was originally a feature idea and then it got workshopped at the Canadian Film Center when Graeme was a showrunner-in-residence and they read a bunch of scripts. 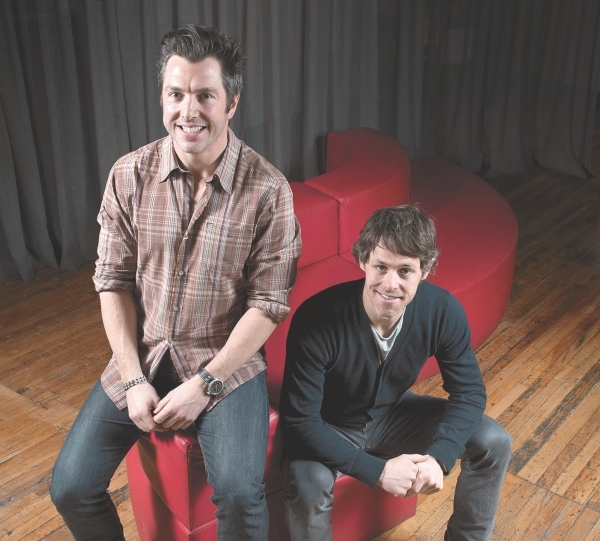 When they both had a little bit of time in between gigs, they decided that they would try and get it up off the ground and they started going to different production companies. We had been trying to work with these guys for a number of years, we were friends, and we worked with them as writer and director respectively, but not as showrunners. So they asked Ivan and I to read it and we read it on a plane to London about 4 years ago and loved it, and as soon as we got off the plane in the cab, we phoned home and said, “Do you whatever you have to do to option this, because we need this script.” That was in 2009 and then from that period on, we began the development process with the two guys and there you have it. FOG! : Let’s backtrack for a second: A lot of people may not understand how the TV industry works, especially from a development, start-to-finish standpoint. Can you briefly tell us what it is you both do? Ivan Schneeberg: Briefly? [laughs] Well, Dave and I are professional. We started as Executive Producers – we’re Creative Producers – of TV shows. We started as showrunners ourselves and then started building a company around ourselves, so that we could make more shows that we were interested in and we effectively built out Temple Street Productions, which is our production company, and it would be like a mini-studio, the equivalent of an American studio, except we don’t deficit finance; we have to raise the funding for our shows, so more like an American independent [studio]. We’ve got about 30 staff now here at Temple Street, many of whom work with us creatively developing different TV shows or for different genres; different things that we’re interested in. Dave and I continue to be the Creative Executive Producers of all of our shows, so any television shows that we make, Dave and I usually make the decision that we want to option them or commission them or work on them. We give notes, creatively, and we approve all the casting. We have in the past done all of the editing in a lot of our shows, as well. We didn’t do that in this case in Orphan Black, we had an editor who did most of the editing with the creative team, but we are creatively accountable for Orphan Black within Temple Street and also to our two broadcasters and our distributor, our worldwide distributor. What is the biggest challenge in this type of show where one actress is playing numerous roles? David Fortier: We kind of experienced that a little bit on [former CBC show] Being Erica. We had a lead actor who was required to be in most of the scenes, so we kind of had a sense of what we were getting ourselves into. 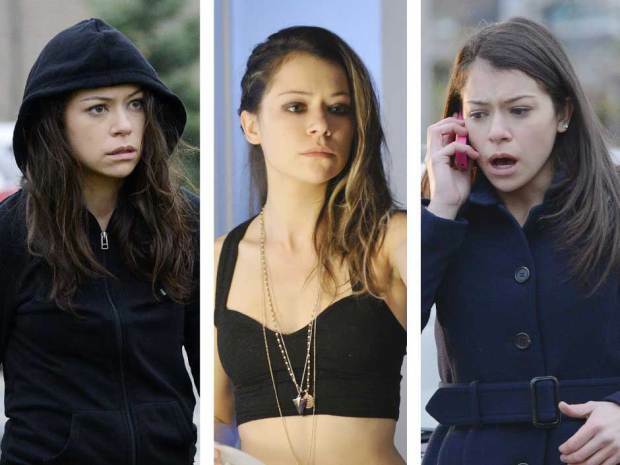 This was more intensive and it’s more intense for [lead actress] Tatiana [Maslany] just because of the technical requirements and just the sheer hours she had to put in, the sheer scenes that she was in, so you start from the premise that your actor’s phenomenal. You have to, because otherwise, you’re not going to a have good show, if it’s this type of show, and that’s a given. I mean, it’s a big given, for sure, but it’s a given. And then once you have that, which we did, you then get into all of the difficulties in terms of hair and makeup, costume, all the rest of it, but really it’s just this war of attrition, this thing that the actor has to go through day in, day out, knowing that they’ve got to spend almost everyday on set and not spending hours upon hours in the trailer. Really you are getting ready for the next scene, you’re on, and you’re shifting between such different characters that, you know, you have to stay focused and you have to stay completely in the moment, which Tatiana was. So I would say that the mental difficulties were sort of equal to the physical difficulties and if I could answer the question short, I don’t know how she did it. How do you film the scenes where Tatiana is acting opposite herself or multiple selves? Ivan Schneeberg: Well, we use a number of different techniques. The most complicated involve motion-control cameras and greenscreens, so effectively, the same scene is shot over and over again with Tatiana in different roles. In many cases, she’s acting against nothing or to a tennis ball or to a spot on the wall. In fact, I think BBC America has posted a really cool little piece of video on their website, and I think on YouTube, as well (http://www.youtube.com/watch?feature=player_embedded&v=4rALHr8gV1E), that shows the layering of the scenes and how they are put together using these motion-control cameras. Essentially, the camera is programmed to shoot the exact same scene and the exact same sequence over and over again without deviating or moving, so where you see the clones actually together, it’s a very sophisticated camera trick, effectively, that’s been developed over the years and you see it used in things like The Social Network and other projects where the same actor plays multiple roles, and then we use a more conventional type of cinematography, in other instances. We cast an actor who’s very, very similar looking to Tatiana. In fact, is very similar in mannerisms and can replicate her mannerisms and acting style very closely, and in scenes where we don’t actually see both clones, she is often playing opposite Tatiana – wearing the same costumes and the same wigs, the same makeup, and so a combination of the motion-control, more sophisticated-type scenes, and then maybe the scenes where we’re using a body double, you’re able to kind of create, we think, a relatively seamless effect of all of these actors and all these characters being together. Does each episode, then, take a little bit longer to film than another 45-minute live-action drama show would? Ivan Schneeberg: It’s hard to answer that question. It’s safe to say that if we didn’t have to do it, we would have been able to shoot what we shot in less time. But I don’t think if you look at it objectively, we’re not shooting longer than any other one-hour necessarily, because there are lots of one-hours that shoot for longer periods of time. It just meant that we had to be very disciplined and again, it goes back to Tatiana’s experience. She’s been acting for a very long time and her technical abilities…she was able to just hit her mark and really zero in on the character she needed to zero in on, so that time wasn’t wasted. Yes, it did take longer, but we made up the time elsewhere. Those clone scenes take longer than normal scenes, without question. We would not have been able to shoot the show within the time we shot it without Tatiana’s skill and professionalism. I think a lesser actor would have resulted in not just a lesser show, but that we would have had bigger problems. What do you perceive to be the biggest challenge in keeping the story fresh for viewers. I know a second season was just ordered, so how do you keep it going? Ivan Schneeberg: For season two, you mean? I guess, in general. Some shows have a longer shelf life than others. Ivan Schneeberg: Look, there’s no question that this show…it would be hard for this show to run as long as Law & Order ran. It’s not a procedural, it’s not an episodic, it’s a serialized story, which means a good serialized story should have a start and an end. With a really good serialized television show, you should know the end going in and you should be writing toward that ending, so as much as we make television for a living and it’s great to have renewals and we do want this show and believe it should run for multiple seasons, there’s an endpoint that the writers and the creators are writing towards. We’re doling out the show very, very intentionally and in a pre-planned way to ensure that we don’t ever break the contract we have with the viewer to tell a really compelling story, and so we’re going into this kind of knowing what the road map of the show is, we have a pretty good sense of where the show needs to go and is supposed to end, so we’re gonna try and stay disciplined and stick to that road map. You’ll see at the end of this season that there’s lots and lots more story to tell and we didn’t just make it up. The writers knew what they wanted to do going in. David Fortier: I think what you really have to do and what everyone is mindful here at Temple Street and in the writing room is that you need a balance; you need to have that character development, you need to fall in love with the characters, for whatever reason, so that you care about what happens in their lives outside the drama and the plotting of the show, if you know what I mean? So, there are just characters’ lives that everyone wants to explore a little bit more and what I think what that does is it allows you to dole out the secrets a little bit slower or at least at your own pace and you don’t feel the pressure as much to give things away at a breakneck pace. I mean, you still want to keep people interested, and you talk about a challenge, your challenge is really striking that balance that people are getting everything they want, they’re getting that character development, they’re getting those personal stories, but they’re also getting juicy plot and action. What do you both geek out about? What turns you into fanboys yourselves? David Fortier: Wow. [laughs] That’s a good question…what do we geek out about…do you mean, like, in actual shows or just in life? Just in life, just in general. Is it cooking? Is it Battlestar Galactica? You know, stuff like that. David Fortier: We geek out about coffee. We just actually opened a cafe last month in Toronto and that was a geek out moment for us. We love coffee so much that we decided to open a cafe – Dineen Coffee. Ivan and I and our third business partner who sort of runs the corporate side of the company, John Young, we spend most of our time talking about the future of the company and we do it at coffee shops, and we love coffee and we talked about, you know, all the origins of it and Toronto’s got a really cool, vibrant coffee community, so we decided to go it on our own. Ivan Schneeberg: Given the season, too, I have to say we also geek out about coffee, but we ARE Canadian-born, so…coffee and hockey. David Fortier: And beers and raccoons and beavers!